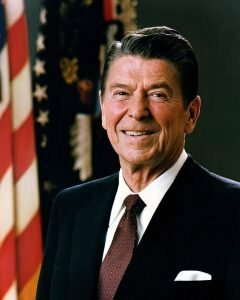 What are the main reasons for Ronald Reagan to support the Islamists during the 1979-1989 war in Afghanistan? Ronald Wilson Reagan was the 40th US president. Very popular, he is best known for contributing to the end of Cold War. Part of which war in Afghanistan is considered. Afghan war started two years prior Reagan’s inauguration, when the Soviet Union intervened in Afghanistan in 1979. During his campaign and following presidency, Reagan was known for his strong anti-USSR rhetorics. In fact, he went as far as calling USSR an “evil empire” in his infamous speech on March 8, 1983, addressed to the National Association of Evangelicals. So it was no surprise that Afghan’s resistance forces were supported by his administration. Being afraid of Soviet invasion and rise of communist party, insurgents named mujahideen fought against government and supporting it USSR army. It’s widely acknowledged that in order to be able to do so, Afghan insurgents began to receive massive amounts of aid, military training in neighboring Pakistan and China, funded primarily by US and Arab Gulf countries governments. The CIA made a historic mistake in encouraging Islamic groups from all over the world to come to Afghanistan (Harrison, 1990). The US provided $3 billion for building up these Islamic groups, and it accepted Pakistan’s demand that they should decide how this money should be spent, Harrison said. With the help from Pakistan and using Islam as a common ground (“mujahid” is a term describing someone engaged in Jihad), US and it’s allies were able to lure big number (up to 2 million people) of trained insurgents as well as contract soldiers to fight against Soviet army. By 1981 the resistance force was united into Islamic Unity of Afghanistan Mujahideen (Lansfor, 2003). At that time Cold War was escalating quickly, and Afghanistan was one of the it’s battlefields. Until the time Mikhail Gorbachev had ascended to power in 1985 and Raegan’s diplomacy ended Cold War, Soviet Union was considered as the main enemy of America. And Reagan supported islamists to hurt USSR’s best interests by any cost and win the War. Harrison S. (1990) . CIA Worked With Pakistan To Create Taliban. Mumbai, India: Times of India. Lansford T. (2003). A bitter harvest: US foreign policy and Afghanistan. Southern Mississippi, USA: Ashgate. How to write a political essay that will impress your professor and fellow students? What are the secrets of capturing your audience’s attention and persuasive writing? You can find answers to all these difficult questions at our blog. The main aim of this blog is to help all the struggling students around the world and make their studying process easier. You can find here useful articles dedicated to various writing techniques, formatting rules and inspirational secrets, samples, created by our writers, and general advice on keeping your brain active and creative. But you cannot become an academic writer within an hour, right? If you are struggling with your political essay, place an order and receive professional help.